It’s Tuesday Tots time again and a wonderful selection of ideas linked up last week. I’m back on form this week and feeling a lot better which is good – now Rainy Day Dad has gone down with it though (and of course it’s a 100 times worse than anything that I had – typical Man!!!). Well I loved the ideas last week and this week I’m featuring some Paint Inspired posts as well as my favourite post from the week. First my favourite post is the first one in a new series by The Golden Gleam all about We get it and the first post on Babies and Children that need to touch – really worth a read and it resonated so much with me. 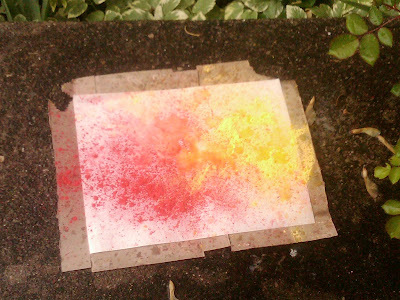 From Make do and Friend some inventive Spice Painting – it’s something that we have planned to do over the summer and I really can’t wait to give it a try. From Miss Courtney Meets Bobo some rain painting – so appropriate for the UK at the moment and another activities that we have planned – although I was waiting until the Autumn to try this with the belief that as it was summer at the moment it wouldn’t rain quite so much as it is. 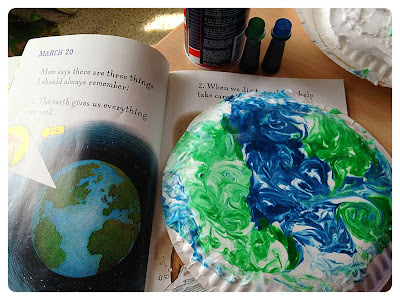 From Fit Kids Clubhouse from shaving foam painting using a book for inspiration – I haven’t heard of the book but I have now added it to my wish list and this is such a fun activity to do as well. And lastly featuring some carrot paint from Growing Together (play, laugh, Learn) – this is something that I’ve been exploring and looking into more and more creating paints and colours from natural dyes especially with T’s tendency to put everything in her mouth. I love the spice painting – we need to try that soon! Thanks for the feature 🙂 A lot of great painting ideas in this post, and we will certainly have to try them all, since we never tire of painting here at the Clubhouse! You made me smile by featuring us as your favorite. =) Can’t wait to try some of these painting techniques this summer with my daughter.